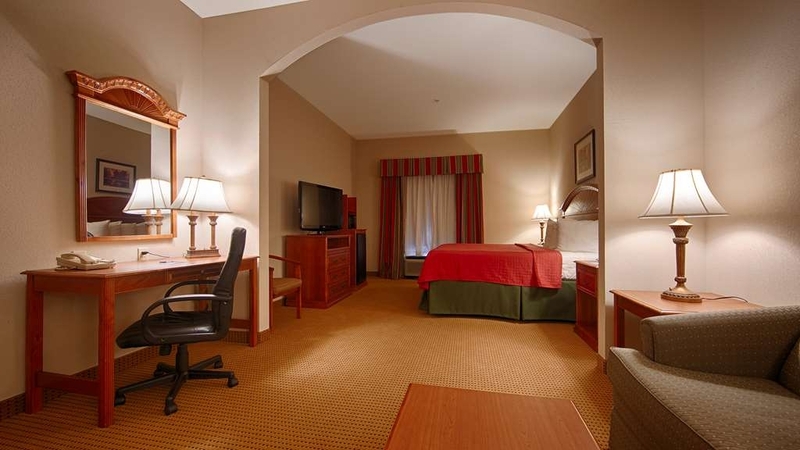 Das Best Western Seminole Inn & Suites ist ideal in Seminole Stadtzentrum zu finden. Erleben Sie ein schöner Aufenthalt in der Nähe von alle Sehenswurdigkeiten. Bestpreisgarantie und exklusive Angebote. Die Hotels in Seminole, Oklahoma, liegen in der Nähe von Sportsman's Lake, einem beliebten See für Wassersportangebote, Entspannung und Familientreffen. Das Jasmine Moran Children's Museum ist nur wenige Minuten vom Best Western Seminole Inn & Suites entfernt – ein echtes Muss für Geschichtsinteressierte und Familien. Ob Sie das Seminole Oil Museum besuchen oder die Freizeitangebote am See nutzen möchten, unser Hotel in Seminole ist Ihr perfektes zweites Zuhause. Hotels in Seminole, Oklahoma, sind umgeben von Kirchen, Geschäften, Restaurants und einer schönen Natur. 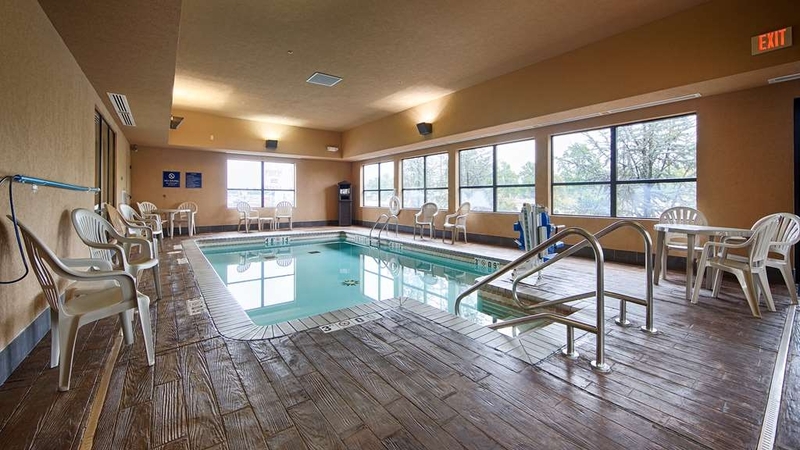 Unser Hotel in Seminole bietet ein beheiztes Hallenbad und eine unschlagbare Lage direkt am Highway 99/Route 377. Jeden Morgen erwartet Sie ein kostenloses Frühstück, mit heißen Waffeln mit Sirup, eine Auswahl an Frühstücksbroten und Gebäckstücken, frischem Obst, Joghurt und verschiedenen Sorten Müsli und Cornflakes (warm und kalt). Runden Sie Ihre Mahlzeit ab mit einer Tasse 100 % Arabica-Kaffee oder gekühlten Säften. Geschäftsreisende schätzen vor allem die großartige Lage unseres Hotels in Seminole und unser kostenloses Frühstück. Mitarbeiter der Eisenbahn, nahe gelegener Kirchen sowie von Erdöl- oder Erdgasfirmen und der lokalen Schlachterei zählen zu unseren regelmäßigen Gästen. Verlassen Sie sich auf die vertraute Marke Best Western, und erleben Sie einen erholsamen und unbeschwerten Aufenthalt. Wir schätzen Gastlichkeit, erschwinglichen Komfort und Qualität. Von Wassersportlern bis zu reisenden Familien, jeder verdient kühle, ruhige Unterkünfte in Seminole. Die freundlichen Mitarbeiter unseres Hotels machen Ihren Aufenthalt zu einem unvergesslichen Erlebnis. Genießen Sie schön eingerichtete Zimmer mit hochwertigen Betten. Einige der besten lokalen Attraktionen sind nur Minuten entfernt, und die gute Autobahnanbindung sorgt dafür, dass Sie alle Reiseziele in der Region ohne Probleme erreichen. Reservieren Sie Ihr Zimmer im Best Western Seminole Inn & Suites, und freuen Sie sich auf einen wunderbaren Aufenthalt! Our stay was excellent. The room was clean and the breakfast was fresh! I'll be back for sure. I've never really used best western but now I'm hooked and will continue to use them in the future. Amazing quality to price comparison! 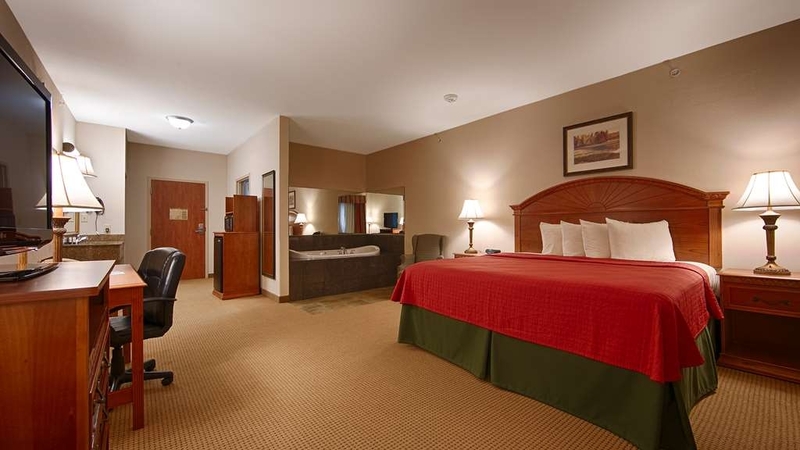 Wonderful ultra clean room, lots of space and a hot tub! The only slightly negative thing I can say is that the bed is VERY firm. I wish it was just a bit softer. If not for that this would be the best place I have ever stayed. Got in late at night and left early the next morning but staff was friendly and made it simple ! Room was clean and everything worked. Easy in and easy out. If ever in Seminole O.K. again I know where Ill be staying. The rooms were cozy and the beds were comfortable. Bathroom was nice with a good water pressure and amenties. Front staff were great! The inside pool was awesome and warm and it was snowing that evening as well. "Jamie rocks the Front Desk!" What a gem! This hotel is 10 miles from I-40, but so worth the time. It is clean and the rooms feel perfectly furnished: not too much nor too little furniture. 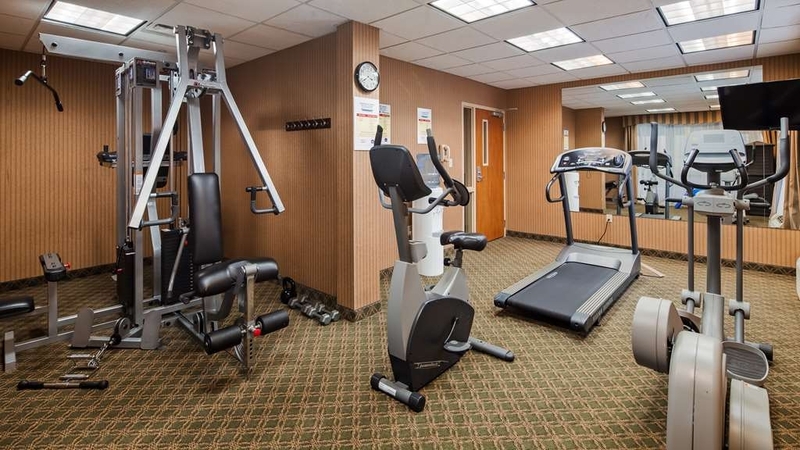 There is a fitness center and a breakfast room. There is a sign at the front desk that lists the various breakfast menus. Jamie took our telephone reservation and checked us in. What a pleasant person! She was very accommodating and readily gave us the extra pillows we needed. A great experience indeed! "Only two hotels in Seminole"
Hotel is newer. We had double queen room. No odors. Beds comfortable. Bath, shower, and room sufficient. Keurig coffee maker was perfect. Breakfast was good: sausage patties, ham. Scrambled eggs and fried eggs alternated. Waffle maker. Muffins. Yogurts. Various cold and hot beverages. Nice indoor pool and workout room. A bit pricey rack rate for the area but this hotel had no real competition. Glad it was there for our visit. Recommend. This hotel is both clean and convenient. Central to all of our activities made it the perfect place to stay for our 3 day weekend. 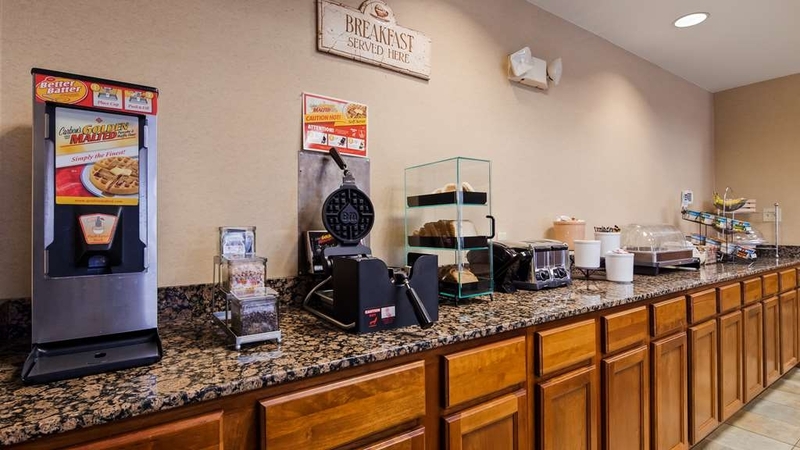 The Breakfast room is a great place to wake up with delicious coffee and to partake of a variety of breakfast choices. The staff is courteous and the WiFi is FREE! MDollarRX, Thank You for staying with us. We appreciate it very much. We hope to see you again soon. I would stay here again, although the front desk employee was smoking outside the door when my husband and I checked in late at night. The hotel was clean and is one of the newest in the area. It's not far from Wewoka Woods Summer Camp. My company put me here. They made a great choice. The front desk staff Jackie and Suzy are awesome. Have not interacted with any other staff due to working the day time. VERY CLEAN and great breakfast. I would recommend this hotel. I wasn't informed about this at checkin but they put me on the 3rd floor which was being renovated. Walls were unfinished, plugs exposed, dirty looking construction people hanging around inside and out, etc.. Trust me, I seen plenty of construction on my drive thru TX. There were stains on the desk chair, no available wall outlet at the desk to plug in laptop, couldn't watch TV unless your in the bed, a/c cut on and off all hours of the night and made horrible noises, bed was uncomfortable, shower had hair in it, breakfast eggs were cold and rubbery, gross pale flat sausage and hard cinnamon rolls.. Just not what I expected for $100.32. I can stay anywhere in these conditions for half of the price. 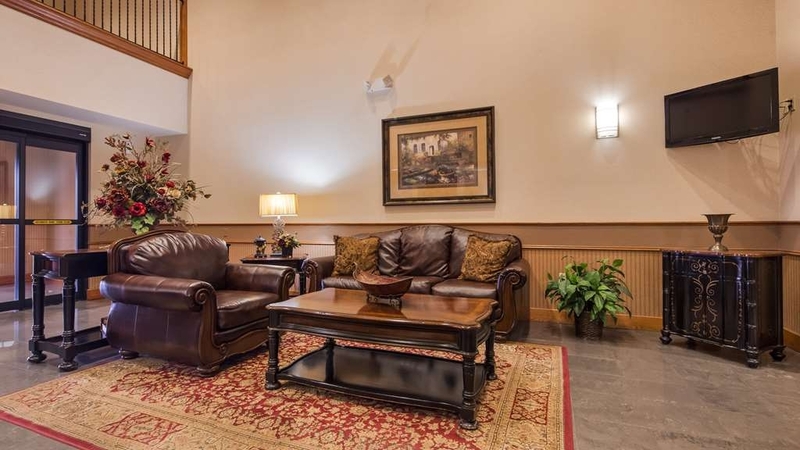 Large room with microwave, fridge, Keurig, desk, arm chair, well located lighting. Comfy king bed, cozy pillows. Everything was clean, and well kept. Exercise room had tread mill, elliptical, bicycle, and weight machine. Indoor pool, hot breakfast. Better value than the Best Western 15 miles away. I am still shocked beyond belief. Consulting lawyers and BW corporate after the attrocious experience, and potentially suing for distress/damages. The hardship we experienced as a direct result of Poor management and staff was horrific. "Just what I needed! A relaxing getaway!" 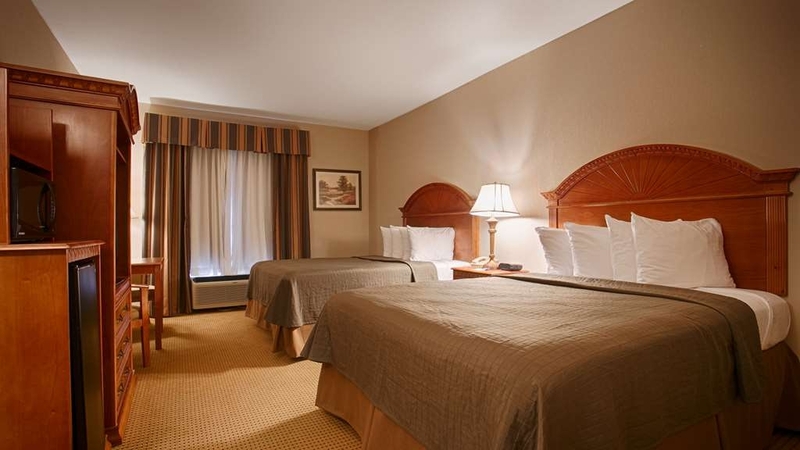 Excellent service, room was very clean, met a housekeeper on the way to my room, Maria. She was very friendly and happy. Said if I needed anything she would help me very satisfied with this stay! Great job! Love the big whirlpool bathtub! It's the reason I stay here! The hotel was very nice, appearing to be relatively new. The staff was extremely cordial and accommodating. The rooms were very clean and the breakfast was more than adequate.. I would recommend this hotel to any business or leisure traveler. Room was clean and spacious. Staff was able to resolve my issue promptly. Nice variety for breakfast. Although there isn't much to do in Seminole, OK I was there for a Christmas Bazar that I set up a booth for my Paparazzi Jewelry. After a long day I wanted to get a good nights sleep and not be disturbed. This was a great place that was convenient to get to and quiet. Didn't get to utilize the pool, but has a great pool. If I had one derogatory remark I'd have to say the toilet was not an enthusiastic flusher. Other than that the room and bathroom was clean, bed was comfy and I REALLY would like to purchase one or two of their pillows! They are that comfortable. We stayed on the 3rd floor. And OH!...there's a Keurig machine in the bathroom! N I C E Ladies at the front desk are awesome and friendly. The breakfast bar is superb. I recommend the Cappuccino machine...came out not too hot and not too cold, frothy and delicious! Breakfast closes at 9:30. Might as well sleep on the concrete!!!! Beds are horrible!!! Don't go out west stairwell you will be locked out and have to walk around. Decent food for breakfast at least. But at breakfast the staff was spraying down tables with what smelt like ammonia making us almost vomit!!! Dear LJjasonh, We are sorry you didn't like our beds, we take all feedback into consideration. All of our mattresses are pillow top Serta; however, we apologize your expectations were not met. We have key swipes on the west and east entrance through the pool area. Thanks again for your feedback. The room was clean and modern with free wifi, good breakfast and friendly staff. The parking lot is well lit at night so we could get glimpses of our work trailer. Felt comfortable and safe. We have stayed here before and will stay again. Reservations were very easy, front desk staff, quick and efficient, breakfast staff quick and efficient, all very friendly, house keeping not efficient in the least, you should never have to go and ask for your towels or to have your trash taken out after they were in your room to clean and replace. Everytime I book into this hotel there is a problem ! They overcharge me or they check me into a room that is not cleaned yet or the housekeeper is still in the room cleaning. When I use my rewards promotions I always have to call them a few days after because they fail to charge me correctly. There doesn't seem to be any concern about customer satisfaction! This hotel is nice and clean and everyone was friendly and the neighborhood is good as well. The free breakfast is awesome for the price! ;) Would recommend this place to anyone . Has a McDonald's next door as well! This is a very nice place to stay in the area. The rates are good; the rooms are very comfortable. The staff are very courteous and helpful. The breakfast offers a big variety; and the warm cookies are great too! I would absolutely stay here again. "Great place to stay (even though there aren't any other real options)"
This is a great place to stay (actually the only "nice" place in Seminole. The location is convenient and there are ample restaurants around, both sit-down and fast-food. The rates are reasonable and the value received is great. Staff is super-friendly, professional, and very responsive. Breakfasts are typical (not a great variety) but well-prepared and presented. The pool is very nice and the business center very adequate. I was in need of a hotel within the area and found this hotel to be reasonably priced, in a great location, and very accommodation. 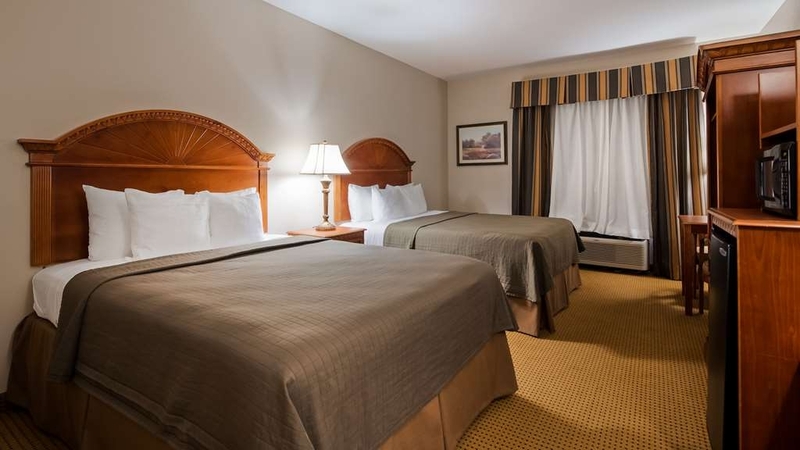 I had a king size bed with jacuzzi tub and the room was clean and very nice for a Best Western. I would recommend this hotel to anyone that is looking for a great hotel with a nice breakfast. Friendly parking as I had a trailer and there is room for 18 wheelers as well. Very nice place to have stopped overnight. 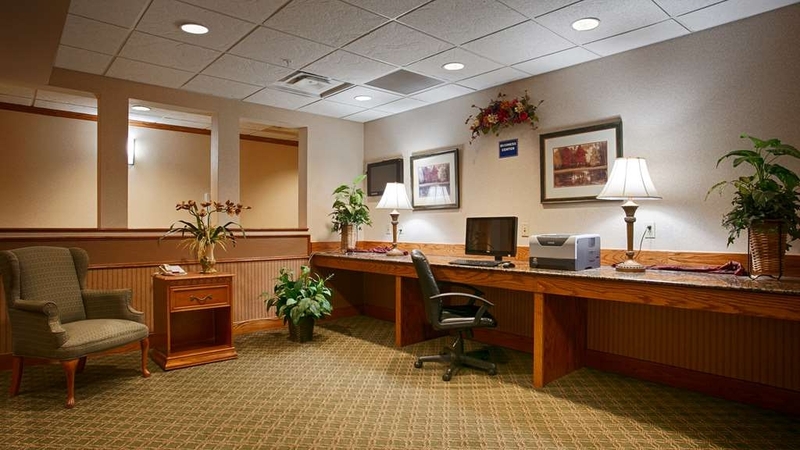 Clean rooms, great breakfast area, and polite staff. Room rates are reasonable for such a nice set up. Mini fridge & microwave in rooms. Breakfast served from 6a-9a, be sure to try out the waffles.. chocolate chips, strawberries, and blueberries available. the room was good. king room w sofa bed. the waffels had strawberry topping you could put on them. made for an amazing breakfast. even allowed free late ck out since we arrived so late (2 am). soft bed. This hotel was very pleasant, located in nice, safe area and will stay again... The room was very nice, comfortable bed and quiet! The pool was nice, and the area was so clean. I would definetely reccommend this for self, or family. The lady at the front desk was very professional and pleasant. The hotel was very clean, and not just the front lobby (where most places show their best, then you see a different story behind the scenes). Every single area I meandered through was exceptionally clean and tidy. My room was nice with comfy beds and pillows. Even had a Keurig to make a cup of coffee. The only negative parts were the people staying across the hall (noisy) and the parking lot could use some resurfacing in areas. Overall, great place to stay. the staff at the best western was very nice and helpful. and rhe room was very clean. i stay out alot and i well be putting this hotel on my list to stop at when i am in the area. safe clean and also very noce people. Very clean,helpful,and friendly invironment. Plus comfortable beds. Hotel is surrounded by great restaurants, grocery store, and pharmacy. 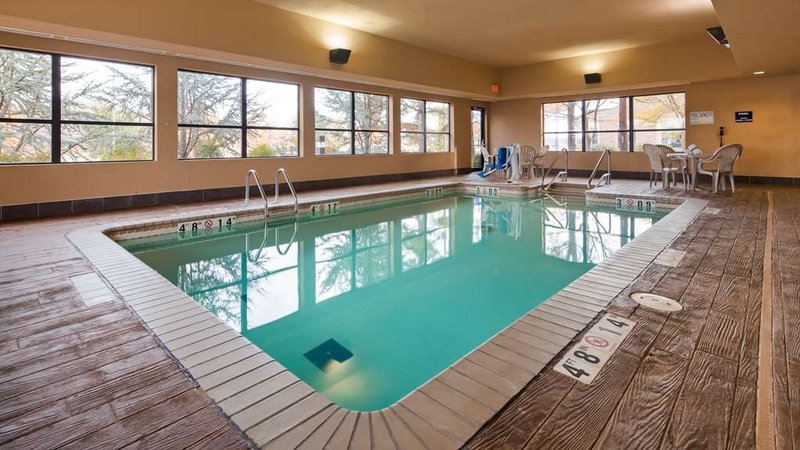 I enjoy the indoor swimming pool and spa. Work facilities are clean and have up to equipment. I look for to staying at the Best Western again if im in the area. Stayed here for 3 nights over Thanksgiving. Stayed in one of the King Suites (minus the whirlpool tub). The room was adequate and the bed was comfortable. My only complaint was the noise coming into the room from the hallway. The door seal was so poor that I could see shadows of people walking in the hall as they past by. Even earplugs didn't help one night. Had to call the desk to ask them to come up and see if they could restore order. They responded quickly and all was well afterwards. The breakfast buffet was surprisingly good and the very overworked lady handling the crowd was very friendly and helpful despite the onslaught of humanity she was faced with. Kudos to her. When back in the area will definitely stay here again. Recommended. Very comfortable, clean and affordable. Staff is pleasant and helpful. Easy access; good parking. Breakfast was very good and staff takes very good care of breakfast area. I would stay here again and would recommend it to family and friends. The hotel was great, except for one thing. I was not informed that payment for the hotel room would be charged to my card prior to the stay. They told me it was just pre-authorization. I would've at least like to have known about this. I have stayed here many times over the past few years. It is clean, has comfy beds and a friendly, helpful staff. I've never had an issue with my reservation. I'm not much of a breakfast person, but the complimentary breakfast appears to be plentiful with good variety. The eating area is clean and spacious. I'm not sure if this is a non-smoking hotel but there are non-smoking rooms. Pets NOT allowed. This is a very nice place to stay. Very quiet, centrally located, clean rooms, nice beds, nice staff. The breakfast was good. Coffee was available at all times. The staff kept everything clean and refilled. The noise level was very well managed. We had a room next to the pool and you hardly knew anyone used it. There were many places to eat next to the hotel. Traveling distance to where you needed to go was always at a minimum. Gas stations were conveniently located. The hotel was near shopping centers, so if you needed anything there was no problem finding a store to purchase items. We have stayed at this pretty new hotel more than one time. The rooms are super nice and the internet speeds are wonderful. Breakfast hot and delicious. My only drawback is if your going to have an inside pool make it warm enough to enjoy. Cold water is not good for tired muscles. Easy access from highway. Several places to eat nearby. Breakfast at the hotel was adequate. Front desk did not have my confirmed reservation on arrival. Room received required higher rate (which I paid). 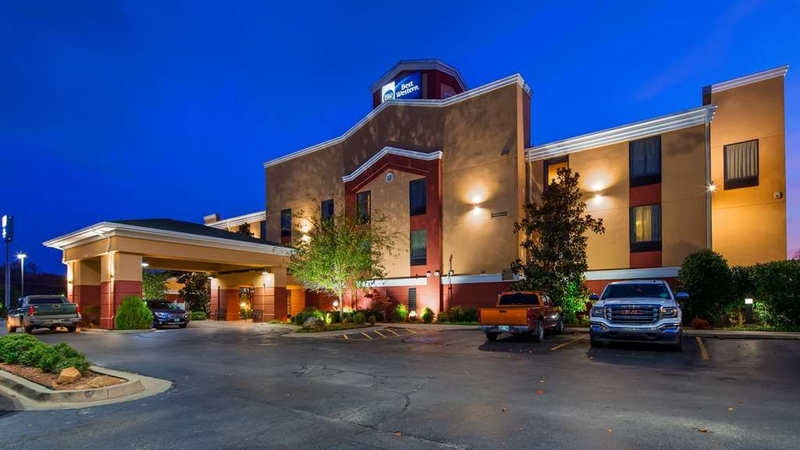 Had a Best Western credit for $50 off from a Best Western promotion. The hotel needed remote support to apply this which they did at check out only after I reminded them that I had submitted this the night before at check in. Came to Seminole for Seminole Days. Good place to stay - quiet and plenty of parking. Rooms were nice size and comfortable. The breakfast was typical and the breakfast area had plenty of room. Did not use the pool but it was a decent size and clean. We found this hotel to be an oasis in small town Oklahoma. Was much more than we expected. 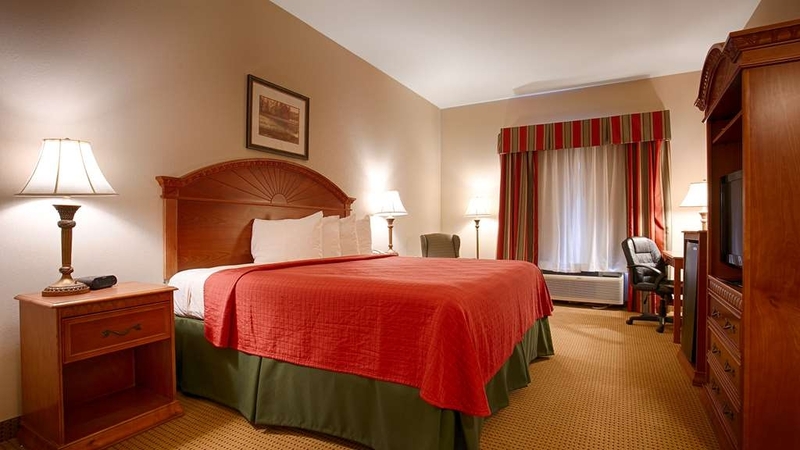 Very clean, friendly staff, comfortable beds, fresh smell, and delicious breakfast! What more can you ask for. Traveling for business and was told this was the best hotel in town. It was average in just about every way. Relatively clean, staff was good at check in but indifferent at check out. The breakfast attendant was helpful and cheerful. "Best Western - Seminole OK"
This is one of the best motels in the Seminole area. It is easy to get in and out of, and has plenty of well lit parking. Breakfast is included for additional value. It typically includes freshly prepared eggs and sausage or bacon, as well as fruit, cereal and other options. The staff is consistently friendly and helpful. "The best option in the area"
Although maybe starting to show it's age a little, the hotel is very clean, well maintained and the staff is SUPER! Polite, eager to please and very efficient right up to housekeeping.Breakfast was good and the bed was easy to sleep in. We drove all night and the front desk was amazing to get us checked in early so we could sleep after being up over 24 hours!! The staff was friendly and the hotel is very nice and clean!! The best shower in a hotel ever!! The pressure was amazing!! Would definitely recommend this hotel and would definitely stay here again!!! It was a great experience . Everrything was clean , but the most important people was kind, and helful . Breakfast was clean but I was expecting better breakfast. I love vanilla cream , I expecting more hot foods , eggs was cold. Bathroom was clean . "Best hotel in small-town Seminole"
We stayed here for one night and had a king bed. It was very spacious and comfortable with a couch and frig. Wasn't too keen on the location since it was across from the elevator on the first floor, too noisy. The only improvement to the room would have been having an outlet on either side of the bed to plug in your cell phone. It was across the room, and I prefer to have my phone beside me especially since I use it for an alarm. I was a bit disappointed that they only had an indoor pool. Great for winter use but not in the summer if you're desiring to lay out and get a tan rather than swim. The breakfast was very nice with hot foods like waffles, eggs, sausage, and biscuits and gravy. Then there was plenty of cereals, juices, fruit, etc. We will definitely be staying here if ever in the Seminole area again. All the other motels are a bit run down and don't have all the amenities this one does. This hotel wasnt too bad. I beleive they were close to capacity so it was definately priced more than it was worth. I paid 150 for a king suite. Breakfast was decent. Work out room wasnt too bad. So if you stay here sont expect anything great but it is a decent place to stay in seminole. We stay here every year to attend jump rope camp and have never had a problem in the last 4 years. The staff is always so friendly and helpful. Several restaurants are close by. If you come to Seminole take a tour of the Grisso Mansion - it is wonderful. This is a great hotel, I stayed here for a week for work. The free breakfast in the morning was a buffet. They have a weight room and a pool. It's located in the middle of the city of Seminole which is by lots of restaurants. I don't usually stay at this brand of hotel, but I was pleasantly surprised at the quality and value of this hotel. My regular brand wasn't available in the area. The staff was very friendly. It was as good as my usual choice. No complaints here. We've been long time customers of Best Western, and this hotel was one of the best we've visited. Excellent service, cleanliness and amenities. We highly recommend this hotel, and it will be our first choice in the future. 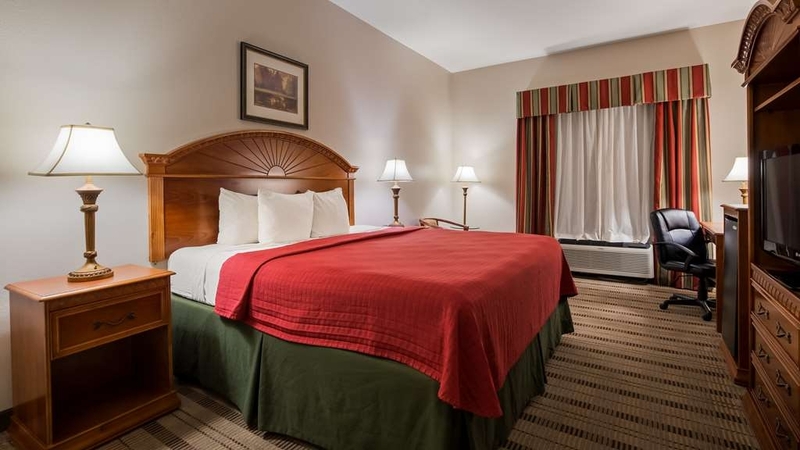 The Best Western in Seminole is the best value for the area. 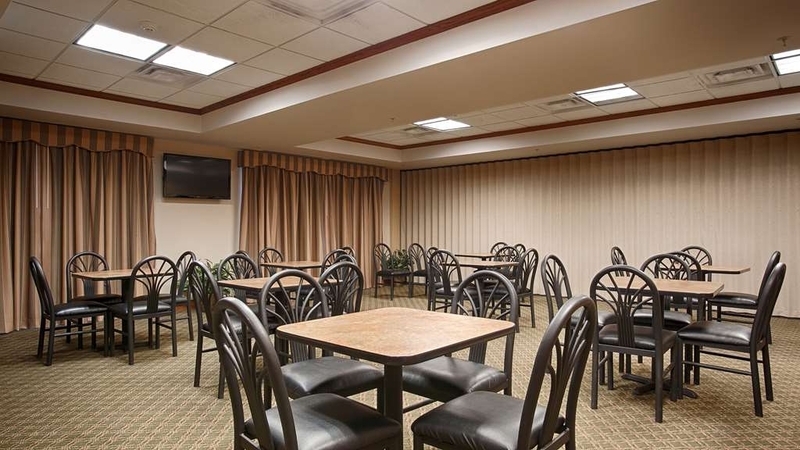 It is a clean motel with good parking and quick access to several eating establishments. I have used this location on several trips in the past and plan to stay here again in the future. "Huge whirlpool tub in King suite"
The clerk was very pleasant and due to a miscommunication on a reservation, I had to request a rollaway bed be brought to the room. This isn't the first time I've had to do that, and at other hotels its usually a couple of phone calls to the desk to get it done. This clerk had the rollaway in the room by the time we unloaded our luggage and got to the room. 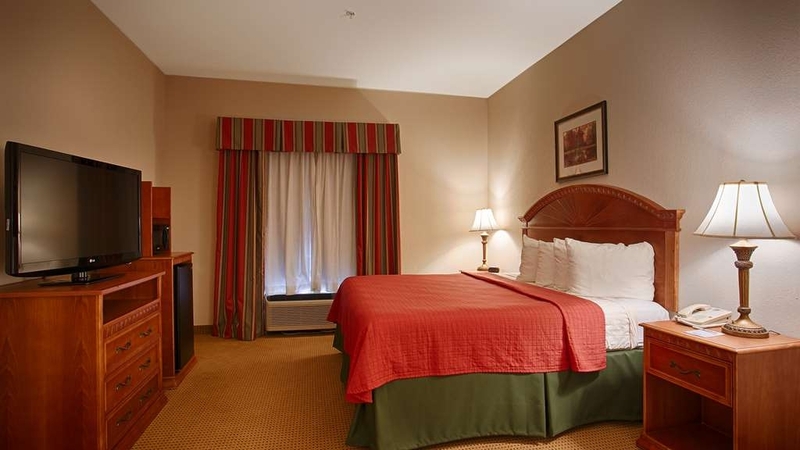 The room was spacious and clean and king bed was comfortable. The 8 year old grandkids loved the jaquzzi in the room. It was large enough for both of them. But, the hot water was very hot when first turned on, and could be a safety issue with young kids. 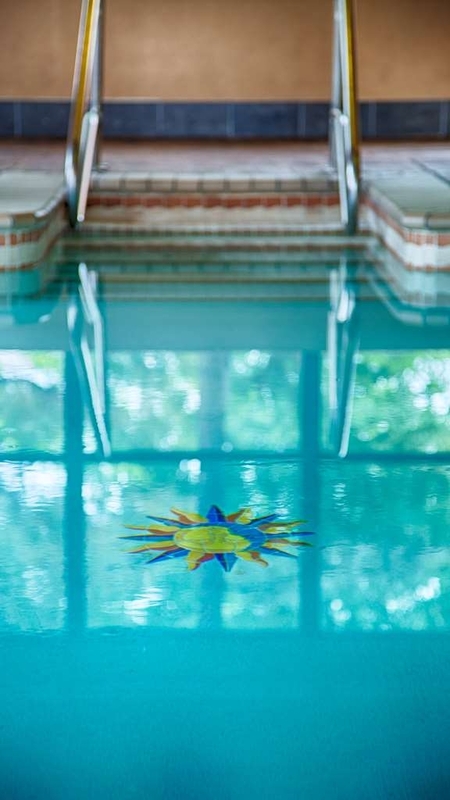 The pool was ok - it was small and still the old chlorine rather than salt water that most pools have converted to. The work out room was ok, too. Breakfast was good with a pretty good selection. I would definitely stay here again. "Just a Good Guess, Best Hotel in Town"
This particular Best Western is not on the busy I-40, so not readily accessed by the majority of travellers. However, I was crossing OK from the south, and am really glad I came across this location when doing the research. 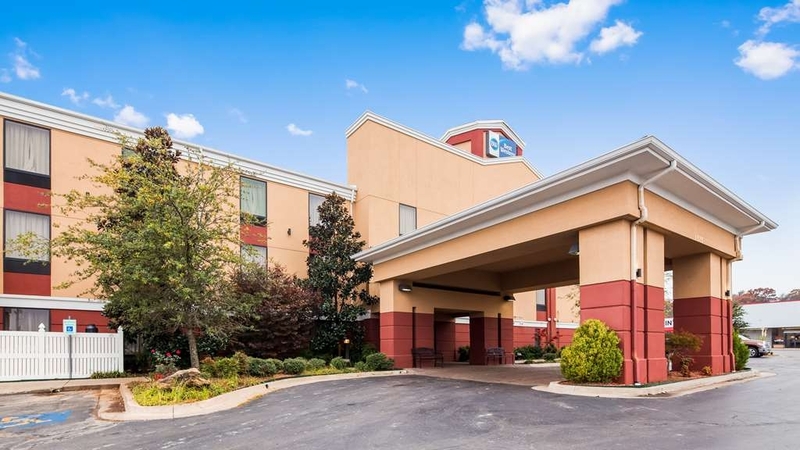 Property wise, this hotel style BW is quite new, and is located very conveniently off of one ogf the main N-S highways. Plenty of room in the parking and adjoining lots, and very easy access. Not located in a very busy town, so quieter overnight. Roomwise, they were very spacious. With most modern hotel rooms, the bathroom was located by the entrance, with plenty of vanity space. Further into the king room(which we chose)was a table, TV/armoir/dresser combo, fridge/micro, and the computer desk in the back. At the time, the WiFi was excellent, but not a lot of guests on the thursday night. In the hotel, there was a smaller indoor pool and a well equipped evercise room. Lobby and vehicle pullup was inviting. Breakfast was a little above average, with waffle, eggs, and other hot items. New additions to breakfast offered in hotes this year has seemingly been toppings for the basic waffle machines that are so common now. At this particular BW, there was apple/berries/choc chips, and some nuts. Everything to dress up a real decent offering. Restaurant wise in the area, there is plenty north and south along US377, but we just chose the McDonalds next door. The rooms were very clean (and I'm extremely picky about the cleanliness of hotel rooms) and the staff was helpful and friendly, even the breakfast tasted great! I will definitely be staying here on my next business trip to this area. This was a great place to stay. The location is favorable, easy to navigate into and out of, right on the main road. The room was big and very clean, the bed was very comfortable. The bathroom was spotless. Everything worked. 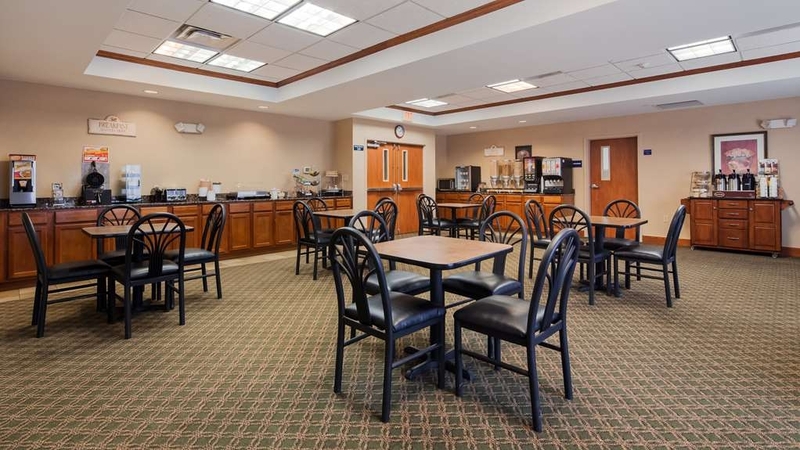 the continental breakfast was good in comparison to a lot of places, offering a hot meal that differed every day to accompany the standard fair of breakfast pastries and cereal. The staff was incredibly friendly and outgoing. I absolutely enjoyed my stay there and plan on making it the place I stay every time we go visit family. "One of the Best of Best Western"
Stayed at this Best Western for six nights and thoroughly enjoyed it. Obviously not the Ritz but a very nice modern hotel. Staff was very nice and tried to accommodate every need. Location is a plus too since near many stores and cafes. Excellent service and great value. Stayed here while in town for family wedding; would recommend to anyone needing a place to stay in the area. Great breakfast items; love the service staff; so very helpful and always pleasant. Seminole is a lovely progressive little town. The Best Western was what I would expect in Seminole. Stayed 3 nights for 50th HS Reunion. No complaints. Service, quality and all services were excellent.. Highly recommend. I manage a hotel & I go into a room looking for things like I expect them. It was almost as clean as I expect my rooms to be cleaned. Clean & pleasant. Friendly staff & a nice breakfast. I would stay there again. The room was very quiet and clean. The visit was relaxing and comfortable. The beds were comfortable and clean. The free breakfast was really good with lots to choose from. The coffee was always hot and never ran out. A big thank you to Jerry, the night lady st this hotel for going above and beyond to help us get a room late at night. We were given a clean room with all the necessities near the rear exit..which made it easy for us to walk outside and use the smoking area. The service was friendly and the "free breakfast" in the morning was fresh..hot.. and delicious.